Honour roll commemorates members of the church who gave their lives in World War One. The Hobart Baptist Church was crowded on Sunday night, upon the occasion of the unveiling of a war memorial tablet within its precincts, extra seating accommodation having to be provided. The Rev. D. F. Mitchell conducted the first part of the service. The tablet was unveiled by Mr. Salisbury, who was a deacon of the church, and lost his only son during the war. Sergeant Roy Cairnduff sounded the "Last Post," and Mr. Norman Farrer sang a solo. The Rev. R. W. Dobbinson an original Anzac, and a vice-president of the Returned Soldiers' League of New South Wales, preached the sermon from the text, "I have fought the good fight. I have finished my course." The whole of the visiting delegation of the Returned Soldiers' League of Australia was present, including members of all denominations, and a large representation of the Fathers' Association, and also of the Wives' and Mothers' Association. The church was suitably decorated with flags. The Mercury (Hobart), 13 November 1923. 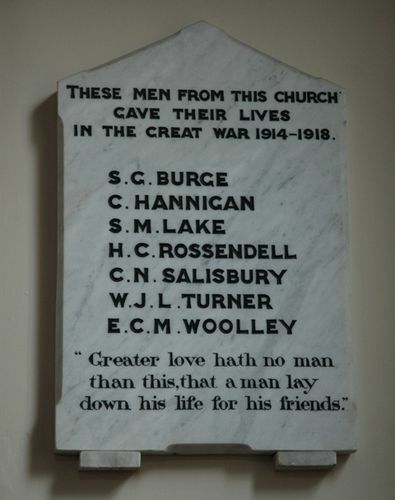 These men from this church gave their lives in the Great War 1914 - 1918.